The blood bank service at Caithness General Hospital in Wick has been suspended with immediate effect following an external inspection. NHS Highland said a number of deficiencies had been identified within the documentation system which would require urgent remedial action. It said patients who had received blood were not at risk. 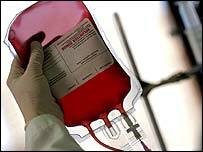 The health authority added that all patients in need of a blood transfusion would be clinically assessed. A spokesman said a small number may be transferred to Raigmore Hospital in Inverness if necessary. An emergency contingency plan has been activated to ensure the continuing safety of all patients admitted to the hospital. The suspension is related to the way in which training records for staff and quality assurance documents were kept. Elaine Mead, chief operating officer with NHS Highland, said the matter was "clearly serious" and the service had been suspended temporarily. She said: "This is not an issue either with the blood or an issue with any transfusion, but the system should have been in place to assure the quality of the way we are managing the service."